British ambassador Peter Millett has again been in Tripoli for talks with members of the Government of National Accord. In addition to those with Presidency Council members Faiez Serraz, Fathi Majbri and Musa Koni, he also met with defence minister Mahdi Barghathi, foreign minister Mohamed Siala and education minister Mohamed Azzabi. “We had constructive discussions in a number of areas of practical cooperation, such as education”, said Millett who was accompanied by a representative of the British Council, the UK’s international organisation to promote culture and education. 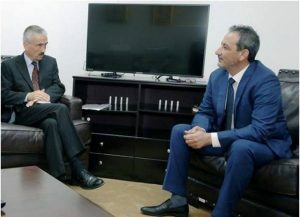 “I was very pleased to have a further visit to Tripoli,” Millett told the Libya Herald, adding that although there were no plans to reopen the British embassy at present there would be more frequent visits by diplomatic staff “to develop tangible cooperation so that the GNA can improve the lives of ordinary Libyans”.